One of the educational opportunities which evolved from the school district merger process in the Spring of 2009 was the Central Valley School District’s All Students’ Advancement Plan (ASAP). Educators who were passionate about raising student achievement at all grade levels developed this plan. A portion of the ASAP program is supported by federal funds through the Title I program. Title I is the largest federal assistance program for our nation’s schools. The goal is to provide a high-quality education for every child. The program provides extra help to students who need it most. In this plan, the Central Valley School District staff will review state and local assessment data to determine cohort and individual student strengths and weaknesses. Upon reviewing the assessment results, staff members will then make data-driven decisions to provide differentiated instruction opportunities for students. ASAP was not only designed to address remediation and reinforcement of curricula but to make academic enhancement a priority as well in the Central Valley School District. The ASAP program is based on the RtII model. 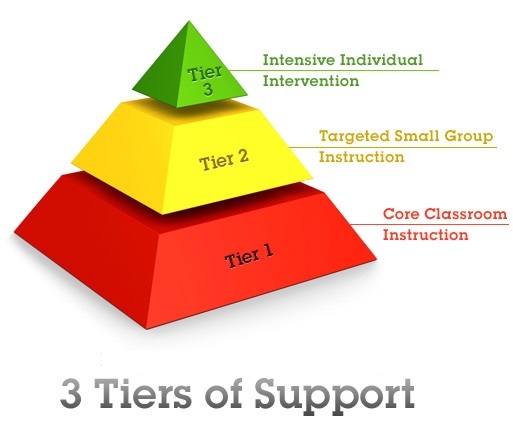 Three levels of Tiered support exist within ASAP. Each classroom teacher provides Tier I support and it is the foundation of every child’s core educational program. Tier II services occur for students that have met the grade level selection criteria. These services occur in addition to the core educational program multiple times per week. Tier III services are provided only after students have been involved within Tier II services. Based on each child’s needs, Tier III services typically occur on a daily basis. To raise student achievement at all grade levels, for all students and prevent academic failure through research-based interventions and data-driven decision making. The ASAP uses multiple measures of assessment to determine eligibility and continue progress monitoring throughout the school year. The assessments used are listed below. The Dynamic Indicators of Basic Early Literacy Skills Next (DIBELS Next) are a set of procedures and measures for assessing the acquisition of early literacy skills from kindergarten through sixth grade. They are designed to be short (one minute) fluency measures used to regularly monitor the development of early literacy and early reading skills. DIBELS was developed to measure recognized and empirically validated skills related to reading outcomes. Each measure has been thoroughly researched and has demonstrated reliability and validity with respect to early literacy development Individual results are predictive of later reading proficiency. The measures also serve as aids in the early identification of students who are not progressing as expected. When used as recommended, the results can be used to evaluate individual student development and to provide grade level feedback toward validated instructional objectives. Founded by educators nearly 40 years ago, Northwest Evaluation Association (NWEA) is a global non-profit educational services organization known for its flagship interim assessment, Measures of Academic Progress (MAP) These assessments measure student growth and learning needs, foster educators’ ability to accelerate student learning, and are based on research that supports assessment validity and data interpretation. In any given classroom, students learn and grow at different rates. To help tailor teaching to meet the needs of all students, this computer adaptive research based assessment is used three times during the school year in grades K-8. The NWEA assessments deliver precise and immediate results that identify learning levels, and the data is used to differentiate instruction. NWEA assessments react to each student’s answers. In the testing world, this makes assessments “adaptive,” or personalized to measure the needs of every student. If you child answers a question correctly, the test follows up with a more challenging question. If your child answers incorrectly, the test follows up with an easier question. This computer-adaptive test dynamically adjusts to each student’s instructional level for personalized testing. It provides a clear understanding of students’ performance across a range of subjects without being limited to a particular grade level, making it easy to develop individualized learning plans. NWEA assessments can be used as a diagnostic tool, to assist with student placement, and to measure gains to provide insight into program effectiveness. DIBELS easyCBM Math is comprised of measures of early numeracy, computation, and problem-solving that function as indicators of the essential skills that every child must master in order to become proficient in mathematics. The measures can be used to quickly and efficiently monitor the development of mathematics skills. DIBELS easyCBM Math is designed for use in identifying children experiencing difficulty in the acquisition of basic mathematics skills, in order to provide support early and prevent the occurrence of later mathematics difficulties. It is an assessment used to measure the acquisition of mathematics skills from kindergarten through sixth grade. To identify students who may be at risk for mathematics difficulties (universal screening). To help teachers identify areas to target instructional support. To monitor at-risk students while they receive additional targeted instruction. To examine the effectiveness of the school’s system of instructional supports. It is specifically designed for use within a problem-solving, outcomes-driven model of decision-making and response to intervention. It is directly aligned to the Common Core State Standards in Mathematics. Its measures are reliable and valid. Its research-based benchmark goals are being developed for the measures, which define a level at which the odds are in the student's favor of meeting later mathematics outcome goals.